R Alexander Fine Art represents the culmination of a vision to connect collectors with emerging to established artists from around the world. 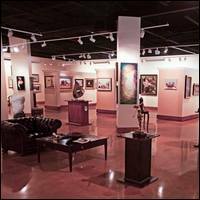 Based right outside Atlanta, the gallery maintains a collection of artwork in a full range of media, including paintings, sculptures, works on paper and photography. The gallery’s program focuses on cultivating a dialogue with the Atlanta community via thematic group shows and solo exhibitions. Parking: Free parking is available at the gallery.